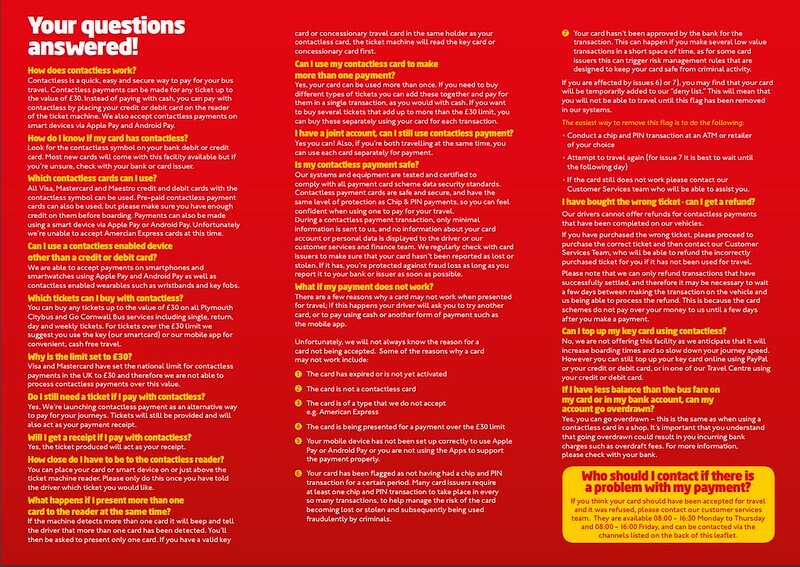 Ask the driver for a ticket (£30 contactless limit applies). Place you contactless card/device over the card reader. 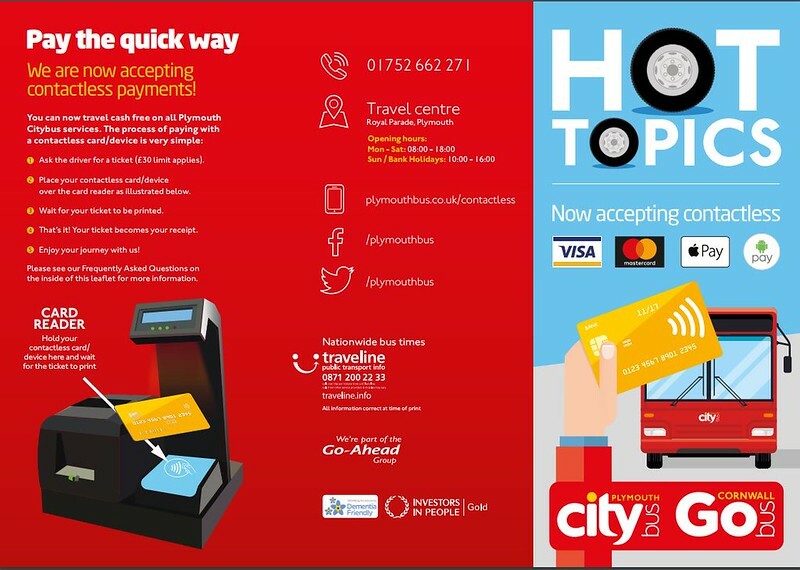 Enjoy your journey with Plymouth Citybus. I can vouch for it working as I am now using it in the mornings saving me trying to find enough cash to pay the fare. It should speed up boarding time, once people get used to paying this way. seems to me to take slightly longer than paying cash at the moment, new machines are not so good for environment as they did out twice as much paper, they also probably count towards some off city bus increase costs as they use twice as much paper and the cost of taking contactless payments charged by the card companies. also puts a cost on the council tax payer as there is double the amount off waste ticket paper to dispose off. Does PCB really still issue that many paper tickets? Here in Brighton IMX most people use Key cards or M-tickets. Isn't that the case in Plymouth? I have been using cashless every day since it started and I haven't noticed it taking any longer than a cash transaction, especially now that all the drivers are used to using the new machines. As for the ticket - its hardly twice the size - maybe about 1 third bigger at the most. Cant see how that will make any difference to waste costs! As for the bank charges - operators also have to pay the banks to handle all the cash transactions too, so I cant see that they will end up out of pocket through bank charges - If the operators were having to pay that much more money to the banks then I doubt very much that they would be that bothered about introducing all these new machines, or at the very least they would be putting up fares to cover the additional costs yet some operators are passing on saving to their customers on some tickets at least.